The Salvation can be summed up in four words: Mads Mikkelsen revenge Western. It’s all you need to know really and if that sounds like your sort of thing then don’t bother reading on, go and buy your ticket now! It’s 1871 in America and Danish soldier Jon (Mads Mikkelsen) has been eagerly waiting for his wife and son’s arrival from Denmark but no sooner that they arrive they encounter a drunk outlaw and events escalate. Jon’s actions draw the attention of the local tyrant Delarue (Jefferey Dean Morgan) who demands that amends must be paid with lives. Mads Mikkelsen is a fantastic lead as the reluctant hero, bringing to mind Clint Eastwood in Spaghetti Westerns as he is a man of few words but you can tell what he is feeling by he’s eyes. The Salvation also stars Mikael Persbrandt as Jon’s brother who is loyal to his brother and just as much the strong and silent type. Eva Green plays a woman who is in Delarue’s “protection”, she had her tongue cut out as a child so doesn’t say a word but you can tell how intelligent and conniving she is by her actions and emotions in her eyes which is a sight to behold. The Salvation is a beautifully shot movie and the colours burst from the screen. There’s moments of suspense as well as humour and it’s not afraid to let moments play out longer than you’d perhaps expect. The Salvation doesn’t bring anything new to the Western genre and doesn’t have any real morally grey characters like some classic Westerns do but that doesn’t mean that it is bad for being more of a simple good guys vs bad guys film. The Salvation is a Danish film, shot in South Africa and edited in the UK – it’s a great film in terms of international team work and because it has Danish roots it feels different to previous Westerns. That being said it still pays homage to the previous films that defined the genre. 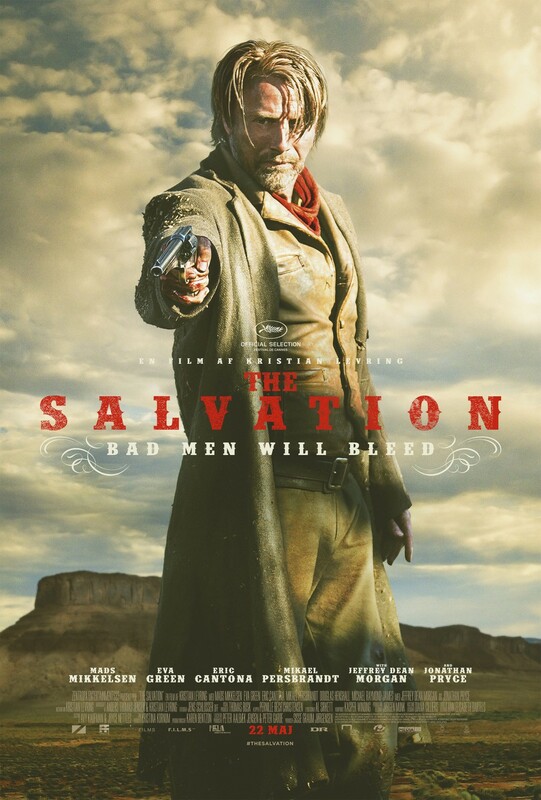 It’s been a while since I’ve seen a Western and The Salvation is a nice addition to the genre. 4/5. There’s still time to catch The Salvation at the London Film Festival – tickets can be bought here.